Friends of the Wild Whoopers (FOTWW) will pay a reward not to exceed $10,000 to anyone who provides information which leads to the arrest and conviction of any individuals who are responsible for the death of a Whooping Crane believed to have occurred during December 2014 in Aransas County, Texas. The partially decomposed body of the Whooping Crane was recovered by Texas Parks and Wildlife (TPDW) game wardens in Aransas County, Texas on Sunday, January 4, 2015. The dead crane was found near a duck blind located in the Aransas Bay system close to Sand Lake. A local hunting guide originally discovered the crane and contacted Game Wardens. The U.S. Fish and Wildlife Service (Service) and Texas Parks and Wildlife Department are continuing to seek information about the dead whooping crane. The Service is also offering a reward in the amount of $2,500 and TPWD is contributing $1,000 for information about the death of the crane. According to the Service, several other Non-Governmental Organizations (NGOs), are also offering up reward money for this effort. The reward will be issued if the death of the whooping crane is determined to be a criminal act and the information provided leads to the criminal conviction of the person(s) responsible. Necropsy results show that the whooping crane may have been handled after death. Anyone with information about the whooping crane’s death is urged to come forward. Information can be provided to the Fish and Wildlife Service’s Houston Office of Law Enforcement at (281) 876-1520, or Operation Game Thief at 1-800-792-GAME (4263). Callers may remain anonymous. 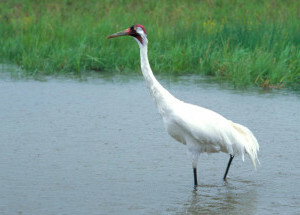 Whooping cranes are protected under the Endangered Species Act and the Migratory Bird Treaty Act. Penalties for harming or killing a crane can range up to a $100,000 fine and/or one year in federal prison. Whooping cranes almost became extinct with only 16 remaining in the 1940s. Through concerted recovery efforts there are now an estimated 304 cranes in the population that winters in Texas. Standing about 5 feet tall, the whooping crane is the tallest flying bird in North America. The purpose of the $10,000 reward is to encourage the public to share information they might have about criminal activities involving Whooping Cranes. Federal, State, Provincial, and other public law enforcement personnel, and criminal accomplices who turn “states” evidence to avoid prosecution, shall not be eligible for this reward. If more than one informant is key to solving a specific case, the reward will be equally divided between the informants. Friends of the Wild Whoopers will continue to provide rewards for killing of whooping cranes in the Aransas/Wood Buffalo flock in accordance with the goals in our mission statement. We invite individuals and other conservation organizations to join with us to establish a reward fund. All donor participants will be acknowledged unless they request to be anonymous. Unfortunately FOTWW’s bank account is very limited and we ask you to do your part. Please contribute to our “Reward Fund” today by donating or joining Friends of the Wild Whoopers. Click here. You may also click on the “Donate” button below..